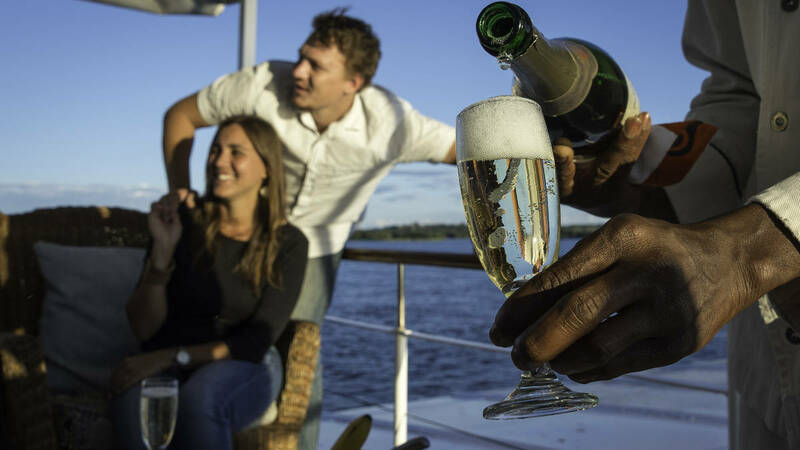 Offering the fabulous combination of the mighty Zambezi River and the elegance of the African Queen Cruise Company, a cruise on the African Queen or the African Princess is an unforgettable experience. The African Queen Cruise Company operates two luxurious vessels. The African Queen is a triple deck, 70 foot catamaran, furnished with Rhodesian Teak, Beech Wood and brass finishes. She was launched on the 7th of May 2001 and can accommodate a total of 120 passengers. The African Princess, launched on the 31st March 2005, is similar in design and build to the African Queen, though slightly smaller, with a passenger carrying capacity of 80 passengers. Full bars on both upper and lower decks serve a selection of cocktails and iced drinks, while the onboard galley presents freshly prepared hot and cold snacks and meals. For those wanting a more exclusive voyage, the Captain’s Cabin is the perfect location to celebrate a special occasion. WhereThe cruise departs from and returns to the Royal Landing at the water's edge. WeatherAll weather, the cruise may delayed should there be a thunderstorm or heavy rain. For a personalized and exclusive service fit for Royalty, enjoy the view from our top deck in the company of the Captain of the African Queen or the African Princess. Private staff will serve you bottled wines, premium brand drinks and tasty snacks within the comfort and privacy of the Captain’s Cabin. You will be accompanied by your private guide from the time of collection at your hotel, during the cruise and on your exclusive transfer after your unforgettable experience.